Cynthia Brown-Elliot is a 48 year old Wal-Mart worker protesting at a Dayton, Ohio area Wal-Mart. 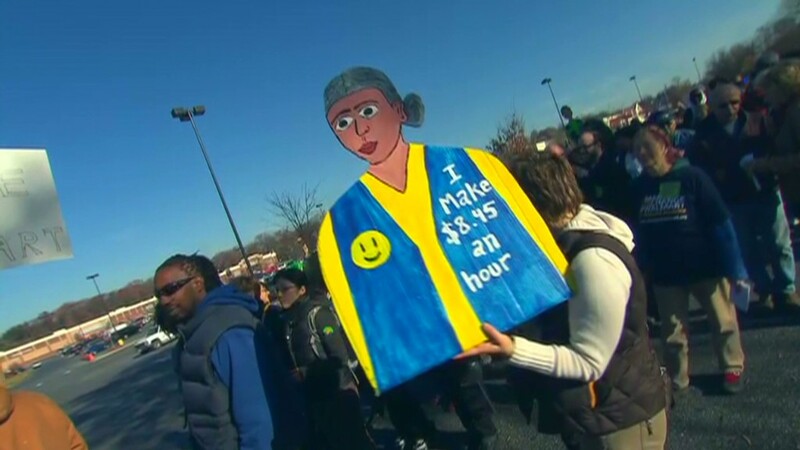 Wal-Mart workers Wednesday joined strikes in several major cities. Union organizers said employees were set to walk picket lines through out the day in Tampa, Miami, Chicago, Milwaukee, Minneapolis, Los Angeles and San Francisco. At a Dayton, Ohio store, Wal-Mart worker Cynthia Brown-Elliott said from her cell phone that she had joined a protest outside the store, chanting slogans such as: "Respect! Now!" Brown-Elliott, 48, who works at a Cincinnati Wal-Mart, said 25 workers were in the picketing line. The grandmother of 14 said she would travel with the group to a later protest in Cincinnati, where she a larger crowd was expected to gather. A cake decorator in the Wal-Mart bakery, Brown-Elliott makes $8.95 an hour. 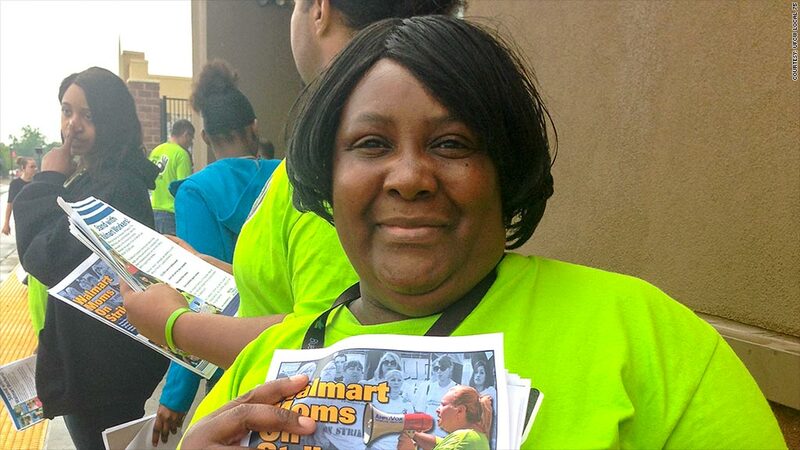 She has been with Wal-Mart for two years and believes she's overworked and underpaid. "Save money and live better?," she said, citing the company's advertising line. "How can you save money if you're not making enough money? How can you you live better if you're not paid enough?" . Brown-Elliott, who lives alone, said she brings home about $1,200 a month, but $500 goes to rent and the rest isn't enough to live decently. While she gets some help from her children with groceries, she still needs to visit food banks. She said she had alerted Wal-Mart she would be striking through a letter supplied by the union. The job actions are timed in conjunction with Wal-Mart (WMT)'s annual shareholder meeting, which takes place Friday in Fayetteville, Ark., near the company's Bentonville headquarters. When asked about Wednesday's strikes, a Wal-Mart spokesman said ,"What we are seeing are very few, if any, people who work for Wal-Mart participating in the activities. The union has to bus people around to different protests." 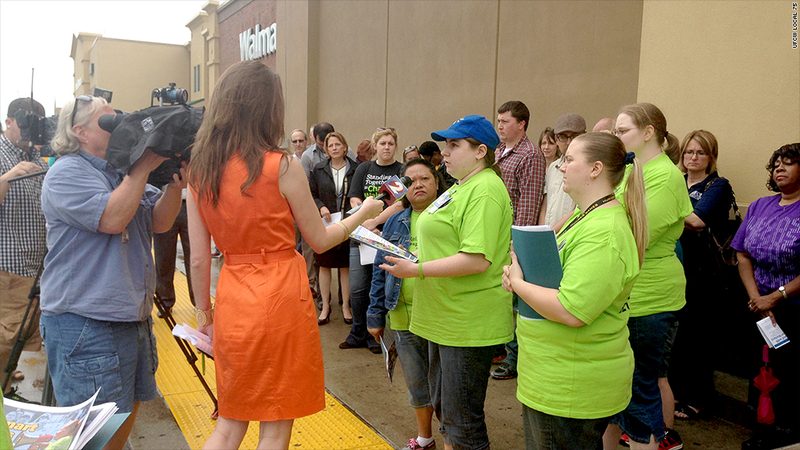 Wal-Mart workers and union organizers talk to a TV crew outside of a Dayton Wal-Mart.